The more I travel to assist horse owners from one end of this country to the other, the more convinced I become that there is a huge gap in the system of our horse owner education, in relation to the horse’s hoof. Children attending pony clubs are given tuition in hoof inspection and basic care and attention of the hoof, and one would assume they carry this knowledge onto adulthood, but what about the adults who venture into the horse world for the first time? It is your responsibility if you own or ride or care for a horse, to seek the how-to knowledge about hoof care and maintenance. Far too many horses suffer needlessly after simple mishaps such as springing a shoe or losing the odd nails while waiting for the farrier to arrive. 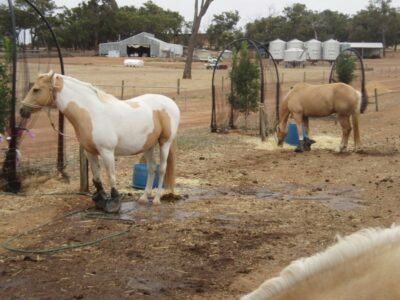 This situation can easily be helped if the owner just has a basic set of hoof care hand tools, and if they learn to take off a bent or loose shoe or replace that missing nail just to avoid problems until help arrives. Horse owners should all learn to pick up and hold the leg of the horse anyhow, so why not practise holding it as the farrier does, then you will have the freedom to use both hands and with a set of basic tools you will be able to perform emergency care when your horse really needs it. As a farrier I can recall many occasions over the years when long term hoof problems could have been avoided if the horse owner had just been able to stabilise the shoe until I arrived. Horse owners should be able to check the digital pulse of the horse if the horse displays lameness or if they suspect there is trauma in the hoof. Place the thumb and forefinger either side of the tendon at the bottom of the fetlock joint. There is no need to know what the ‘normal’ pulse is – simply compare to the other leg. Any elevated pulse indicates a problem in the hoof. It is worthwhile noting that if the horse displays lameness but there is no elevated digital pulse, then the problem is not in the hoof, so look to the hips, back, neck etc. There are many books available which explain the procedure involved in hoof care and maintenance, however as you will soon find out this is a ‘doing’ kind of job; you must be prepared to get down and get your hands dirty, and if you can only manage to bend over like the farrier for a minute or two, it is a start. Remember practice makes perfect, so just keep doing it often enough and eventually both you and your horse will become comfortable and you will get to like it. 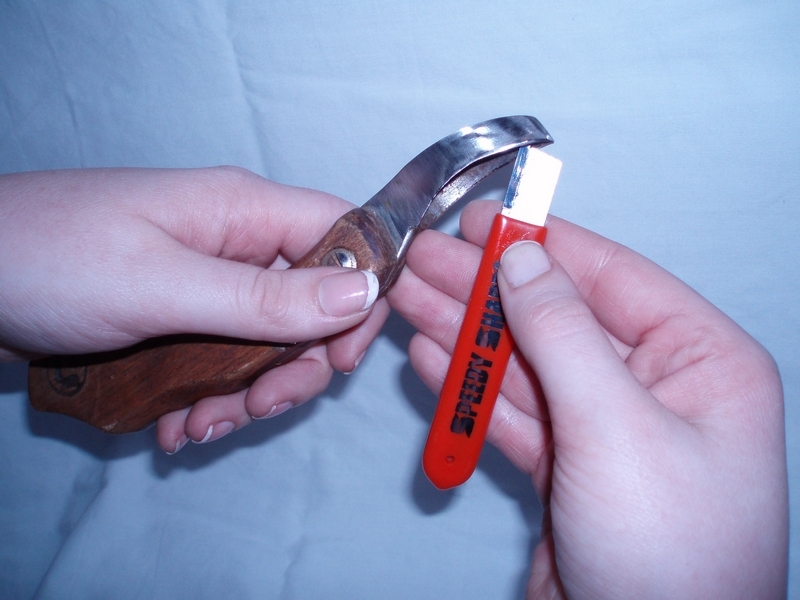 Hoof knife – for cleaning out the sole area of dirt etc. Buffer – for un-clinching the nail. Nail puller- for removing the faulty nail. Shoe puller – for lifting off the shoe. Hoof rasp – for smoothing off the rough edges of the hoof wall. Farrier’s hammer of medium weight – for driving nails. Clinching block – for holding under the end of the nail while it is being tensioned with the hammer. Farrier’s leather apron or chaps – for protection of your own legs and jeans. All this is usually sold in a leather roll with pockets to keep each tool separate and in good order and condition. Consult with your own farrier if possible; he should be able to help you with any questions regarding your special needs and together you will be able to better care for your horse. Participants on my courses arrive very confused about what tools they should use, and also arrive with an amazing variety of tools. 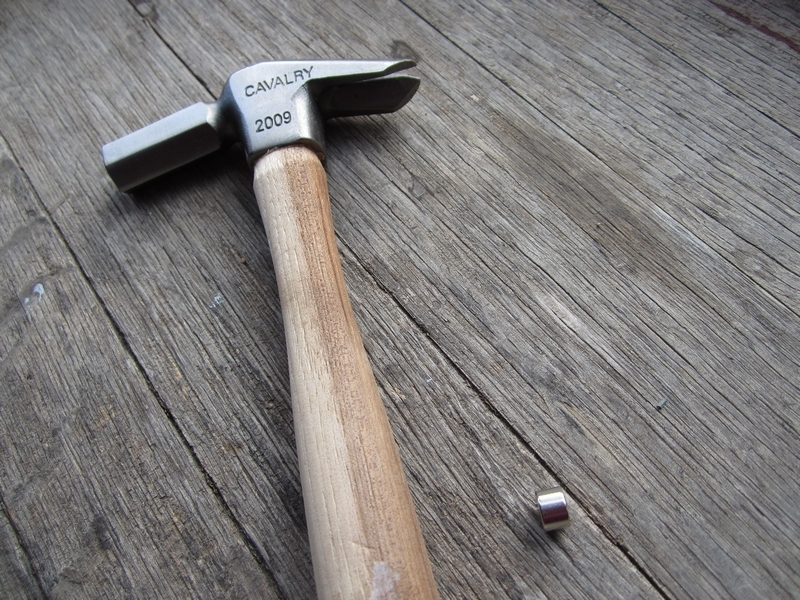 Claw hammers are carpenters tools and are not suitable for shoeing horses. 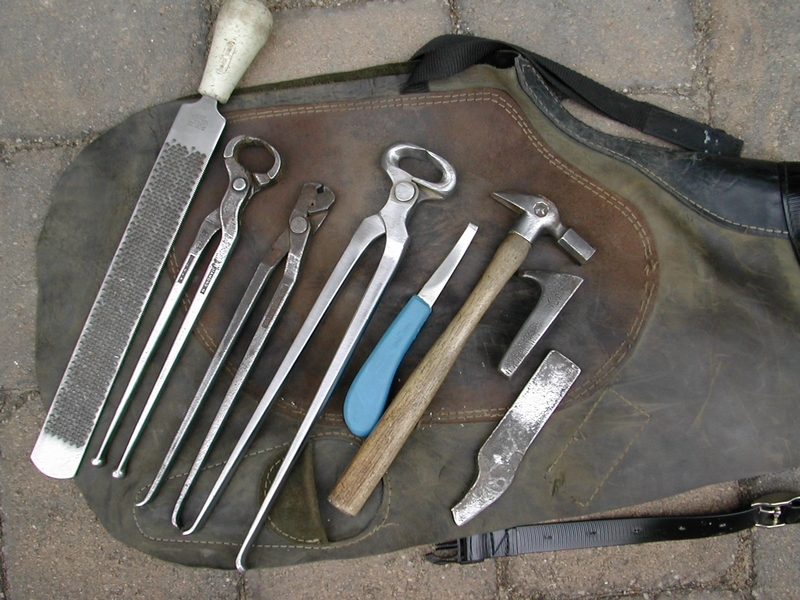 Farriers’ tools are available in a huge range of prices. The old adage that you get what you pay for is very true, but perspective on how much use that tool will receive needs to be kept in mind. If you are only ever intending to trim, then buy the best quality rasp available, and buy a handle with it. 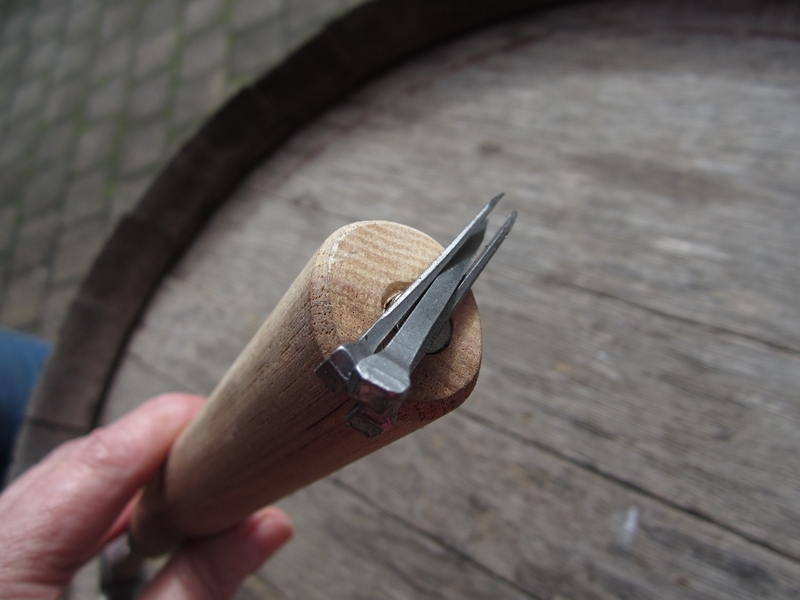 A lot of people don’t realise that rasps can be sharpened up to 10 or 12 times; you can even do it yourself. To sharpen your own rasps, make a 100mm PVC cylinder the same length as the rasp with a PVC cap screwed onto the bottom. Place blunt rasps in the cylinder with handle end upwards, then fill the tube with neat hydrochloric acid, leave uncovered in a well ventilated space for four to six hours, remove and wash in bicarbonate of soda and water solution to neutralise the acid, dry the rasps and spray with WD40 or similar. Make sure to observe the safety regulations for the acid. Buy a pair of nippers in the middle price bracket. The length of the nippers depends on the span of your hands. Better leverage is obtained with 16” nippers, but a person with small hands may better off with 12” nippers. A nipper spring (available on my website) is excellent for nippers with no return spring. Hoof knives are available from around $35. Keep it sharp and it will do a better job. But if you have $120 to spend on a good quality loop knife, your job will be so much easier. Always use a hoof knife or loop knife by cutting from the frog down to the toe or from the frog out to the sides; that way you will not cut the frog and most importantly you will not risk cutting the veins and arteries in your arm if the horse moves. You need to sharpen hoof knives and sole knives to make your job as easy as possible – I promote the Speedy Sharpener (available on my website) which sharpens any type of hoof knife. Sole Chisels are not available commercially to my knowledge, but I make my own. It makes the job easier when confronted with a horse with a rock hard overgrown sole. You can order one from me or make your own. Farriers’ aprons are to protect your legs as well as your jeans, so don’t ever do the job without one. But do try it on and walk around in it before you buy it – points to look for are ease of securing the apron, length of the apron (I am tall but I like short aprons, some people like their aprons to ankle length), weight of apron on your body, weight of apron in relation to climate (leather aprons with light weight waist areas are now available and certainly keep the body temperature down). 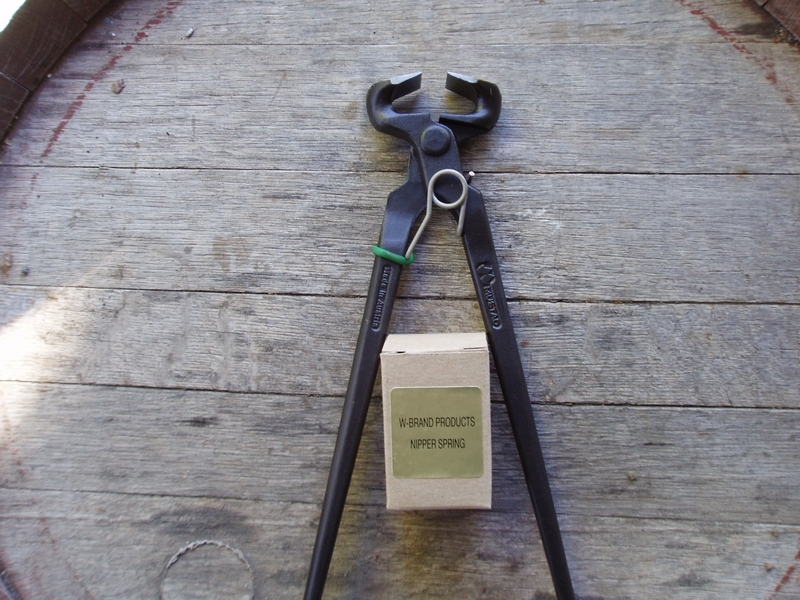 Also needed for shoeing or just to be able to remove a dislodged shoe before the farrier gets there you will need a buffer for un-clinching the nail, a nail puller for removing the faulty nail, and a shoe puller for lifting off the shoe. Having outlaid money on farriers’ tools, look after them. Don’t use nippers to remove nails – it will chip the blade. Don’t use the hammer for carpentry. 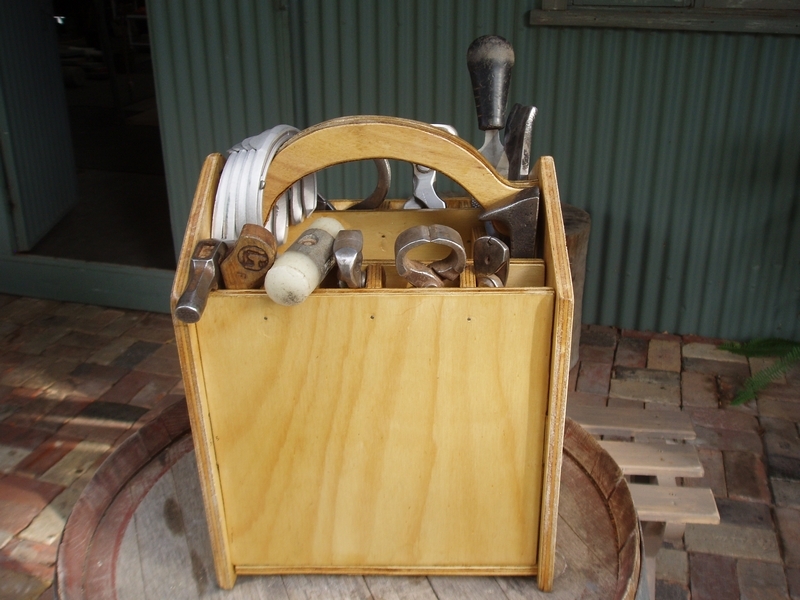 Ideally use a farriers’ tool box – it keeps the tools in order, and it is easier to reach down to a box than to reach right down to the ground for a tool on a tool roll. 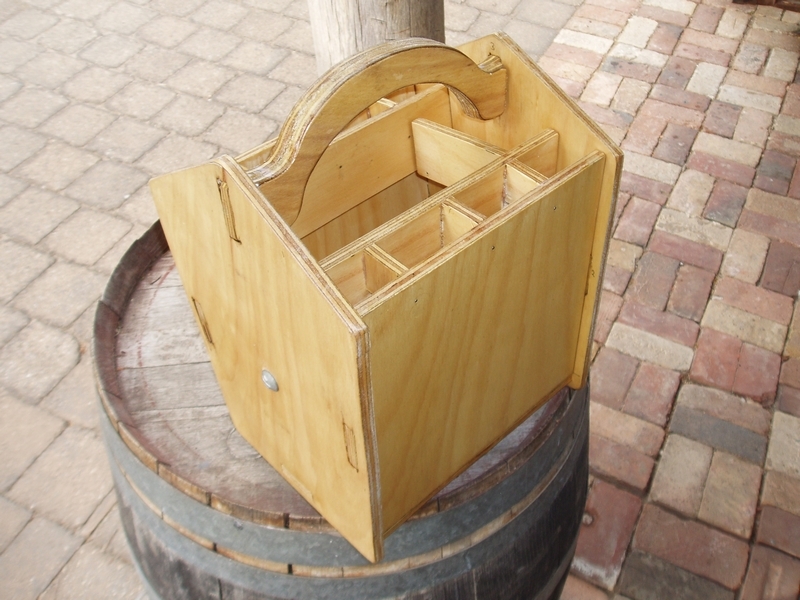 I have a free design for a lightweight plywood toolbox on my website if you want to make your own or I sell the toolboxes on my website. Keep a large magnet in the tool box, flick the discarded clinches into the box and they are out of harms way. Anyone who discards nails onto the ground should not be around horses. A magnet in the end of the hammer handle is great for retrieving stray nails and yes I sell them on my website along with larger magnets to screw onto tool boxes to hold the next six nails or any metal tool. If you own horses, you should always have on hand some purple spray or iodine, and at least one Animal Lintex Poultice and a roll of two inch Elastoplast. People ringing me with a problem are often daunted when I tell them to immediately apply a poultice, but it is no big deal and any horse owner can do it. If your horse gets a sole puncture or bleeds from the hoof for whatever reason, dirt going into the puncture will immediately result in infection and possible abscessing. Wash the hoof, spray with purple spray or iodine, then soak the Animal Lintex Poultice in cold water and put onto the sole with the plastic facing outwards. Spread the edges of the poultice up the hoof, then use the whole roll of Elastoplast to hold the poultice in place, wrapping around and around the hoof. Yes it will stick to itself, despite the wetness of the poultice. One little treasure for the tool box is a plastic fancy butterfly clip – the type women use in their hair. If you have a horse that continually swishes its tail while trimming or shoeing, put the clip in the hair on the top of the tail and behold! No more swishing. I shod a horse recently that got tired of not being able to swish its tail, so it carefully backed itself into the wall and knocked the clip off. The sole and the hoof wall react differently in a dry climate to protect itself from the prolonged dry conditions. In extended dry periods, Mother Nature hedges her bets as to when the ground surfaces are ever going to be soft again, and so she does not allow the old sole to come away, giving the hoof more protection from underneath. This has the resultant effect (Pic 1) of also allowing the hoof wall to become longer and in some cases more flared at the toe and the sides and as a result the horse’s mobility becomes very unstable. This is where we need to intervene in order to restore the natural flexibility of the hoof. The barefoot trimmers maintain that the horse needs sole callous and they won’t remove it. However, sole callous builds up for the reasons already explained, and when it has gone too far it results in big ugly hooves and lack of mobility. A sharp sole knife is a farrier’s necessity in all climates. The Speedy Sharpener is the perfect tool for sharpening sole knives and ideal for sharpening loop knives and is available on my website (Pic 2). However, extreme conditions call for further help. In dry areas one way to soften the sole is to use water boots. Slip a two foot length of tyre inner tube over the hoof, fold back under the sole and up the back of the fetlock, fill with 1-2 cups of water then tape firmly around the pastern (Pic 3). Leave overnight if possible, but even an hour or two will make a noticeable difference. Excess sole should be removed when it becomes weight bearing especially in the bar area as the bars will bend outwards and crack and become infected. When the sole is too hard and dry to be taken out with a sole knife it must still be removed, so delicately use a sole chisel and hammer (Pic 4) to get under the crusty old sole and bar and it will come away easily if it is ready to, then you can control the hoof wall length and avoid costly flaring problems, and you will still be working within nature’s requirements. 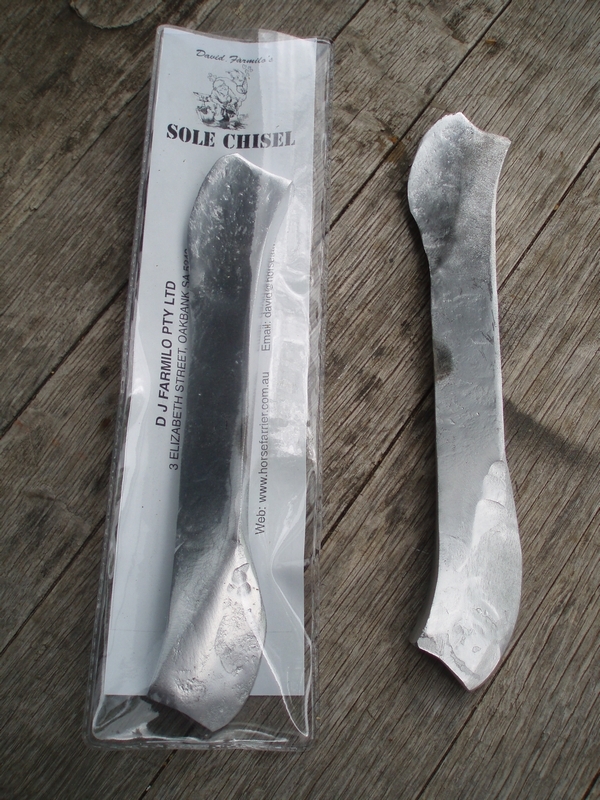 The sole chisel was one of the most effective tools used by farriers in the past, but sadly it is mostly unheard of nowadays so I make and market my own (also available on my website along with nylon hammer to save concussion on both the horse and on your ears). Trimming the hoof wall back into shape for unshod or shod preparation without first preparing the sole will make the horse bear weight on its sole and it will very soon develop bruising in that area. I have seen countless horses in dry months with action problems where all I have had to do is remove the excess sole and overgrown bars to rectify this. The standard excuse that ‘it is too hard and dry so I will leave it there till next time’ is just not good enough for the horse.